The 2015 Porsche 911 GT3 RS is equipped with the maximum degree of motorsport technology that is currently possible in a street-legal 911 that is suitable for everyday driving. Extensive modifications to its drive system, aerodynamics and lightweight design enhance performance even more than in the 911 GT3. With a lap time of seven minutes and 20 seconds, the new 911 GT3 RS even beats the historic record value of the Carrera GT super sports car of just under seven minutes and 29 seconds on the North Loop of the Nürburgring. This once again qualifies the high-performance sports car as the benchmark in its class – directly at its launch. 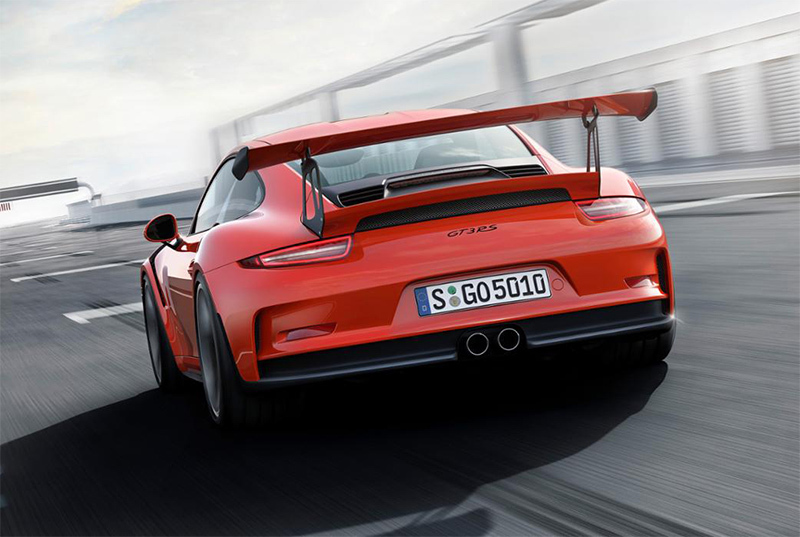 The 911 GT3 RS is celebrating its world premiere at the 2015 Geneva International Motor Show. Motorsport expertise is the reason for this superior performance. The 911 GT3 RS is powered by a four-litre six-cylinder engine with 500 hp (368 kW) of power and 480 Newton metres of torque, combined with a specially developed PDK transmission. The engine, which has the largest displacement and most power of any naturally aspirated engine with direct fuel injection in the 911 family, accelerates the high-performance sports car from zero to 100 km/h in 3.3 seconds and to 200 km/h in 10.9 seconds. Its combined NEDC fuel consumption is 12.7 l/100 km. Functions such as declutching by “paddle neutral” – which is comparable to pressing the clutch with a conventional manual gearbox – and speed limiting by the Pit Speed button have been customised for motorsport use. They give drivers more freedom in terms of driving dynamics, while also providing them with more assistance when driving on a circuit racetrack. The 911 GT3 RS is a masterpiece of intelligent lightweight design. For the first time, the roof is made of magnesium; carbon fibre is used for the engine and luggage compartment lids, and other lightweight components are made of alternative materials. This makes the RS model around ten kilograms lighter than the 911 GT3. In addition, the lightweight roof lowers the sports car’s centre of gravity which improves its excellent lateral dynamics. The body comes from the 911 Turbo, and it signifies its status as nearly a race car driving machine with its RS-specific aerodynamic add-on parts. The front spoiler lip, which extends nearly to the road, and the large rear wing reinforce its dominant look. The optional Sport Chrono Package, which features – in addition to its integrated timers – the Porsche Track Precision app for a smartphone. The Track Precision app can be used to have lap times automatically measured via GPS, and to log data on a smartphone for many driving parameters such as vehicle speed, lateral acceleration as well as acceleration and deceleration in the driving direction. It manages this data and lets the driver share and compare it with other drivers. 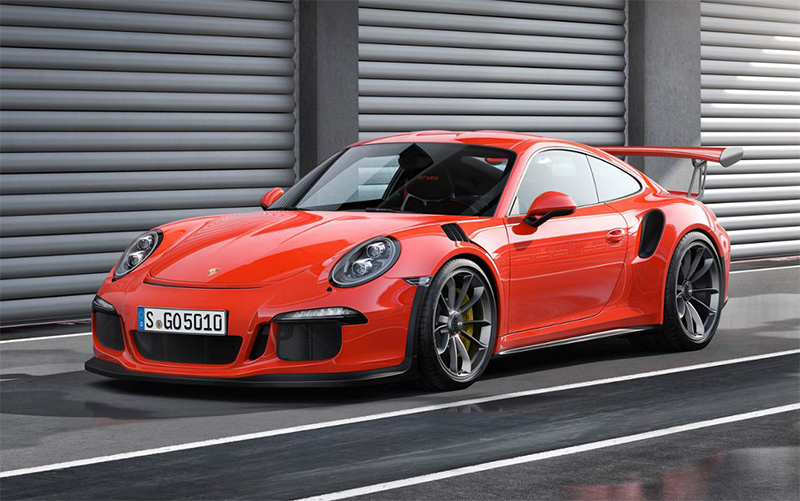 The 911 GT3 RS can be ordered now, and it will launch on the German market starting in May 2015.